On 20th October 1999 the First Annual General Meeting of Ballygarrett Golf Society was held in the Schooner and the following is an extract from the local papers as well as the first results of the society first official outing. 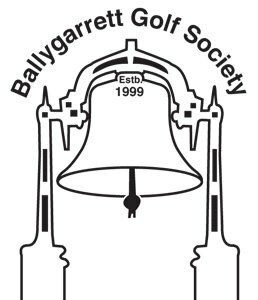 A new golf society has been formed in Ballygarrett, the society which is open to both male, females and juveniles held their first outing (turkey competition) at Ballymoney Golf course on Saturday 20/11/99. 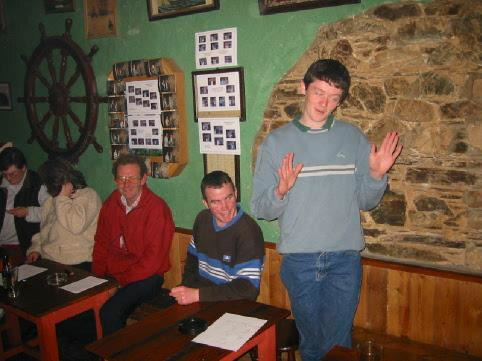 The presentation of prizes took place that evening in the Schooner bar were also the first inaugural meeting of the society was held. The following officers were elected. Assistant Treasurer Maria O, Connor. The real work began after that meeting, a constitution for the society was devised and is still in force to this date. The next issue to be decided was the all important issue of the Crest for the society, this was the cause of long debates and it was decided to use the Church bells as the crest of the society and it is proudly displayed by our members on their polo shirts and windbreakers. Membership of the society is open to both male and female who live or have lived in the Ballygarrett area, as Ballygarrett is a tourist hot spot with many people having holiday homes membership is also open to them. When the society started it had approximately 25 members, it now boasts 45 members. Sponsors were our next problem and our members didn't let us down then, to the following we thank them for their generosity and support in getting the society to were it is today. 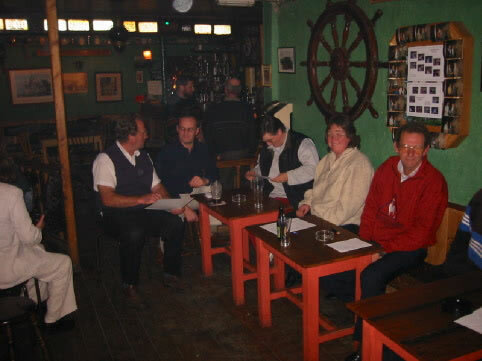 The Schooner, Main Street Ballygarrett, is the "Clubhouse" for the Ballygarrett Golfing Society. This establishment is a firm favourite with the members of the Ballygarrett Golf Society. The proprietor Jim Kehoe generously supports the Society throughout the year. The Schooner is situated in the village of Ballygarrett. Its local business compliments its surroundings. Tea time drinking is a speciality with locals, many of them society members, dropping in most evenings after work. The Schooner is open 7 days a week. So if you're passing through Ballygarrett Village drop in for a visit, Jim and his staff will be delighted to look after you.